There are some great hikes in Rio de Janeiro. I have picked out a few that are easy to access and that I think are really good. I also will describe how you can reach other hikes in more remote locations. On all these hikes I recommend hiking boots, mosquito repellent and to bring water. There are poisonous snakes, the risk to get bitten is small but pay attention to where you put your feet and hands. Instead of taking a taxi or the train to visit this landmark you can actually hike up there. Walking up the common road from the Cosme Velho side is not to recommend due to many robberies. From the lake side you can reach the top on a fairly steep trail in a few hours. Dense rainforest, streams of water and animals are all there as well as spectacular views of the city. Like on many hikes in Rio there are no real signs, just aim for Christ and keep walking. The entrance to the trail is inside Parque Lage in the neighborhood Jardim Botânico, located at the far right end next to some ruins. Don’t bring valuables since robberies sometimes occurs. At the top you pay entrance to the statue. The first is just a short hike, maybe 30 minutes, but it gives you some nice views and also free entrance to the first hill on the famous gondola cable car’s way to the top of the Sugarloaf; it’s called Morro da Urca. The start of the trail you will find by walking along Praia Vermelha to the left and continuing along the walkway until you see a path steeply enter the forest on your left. Just walk right up, when you get to the top and get a view of Botafogo and Flamengo take a left and you will soon be at the gondola station. If you go right you will arrive at the Sugarloaf but to reach the top there you need some climbing gear or to take the cable car. 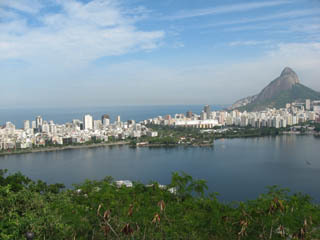 Go down to Lagoa when in Ipanema and walk along the lake counter-clockwise. Soon you will se lush forest climbing up the hill on your right hand side, that’s Parque das Catacumbas. This was actually a favela until 1970 when all the houses were torn down and the inhabitants moved to new housing projects. Trees and plants were cultivated and today you have a rich plant and animal life. You also have a permanent open air sculpture exhibition. The actual hike is only about 20 minutes, at the top is a great view. One of the easiest hikes in Rio. There are quite few other good hikes around but I don’t recommend you doing them on your own. If you don’t know your way it can be dangerous but also you probably would miss out on the best parts, you need a local. You may already have a Brazilian friend that wants to show you or just go on an organized tour. There are many operators out there and with their expertise you will get information about plants and wildlife as well as a 100% guarantee to reach your goal. Search on the internet or ask in your hostel/hotel and you’ll find some companies you can contact. An option I can recommend through a friend of mine is to go on a guided hike up either of these two hills, this also includes a visit to the two favelas there. Located right in the middle of Copacabana and Ipanema, the reward is some spectacular views. Contact English-speaking Gilmar Lopes and his company Tabritur for more info. Tabritur, gilmar.lopes|at|talk21.com, tel. +55 21 99369-2844.